Rubbish collected along Sunshine Coast beaches. Turtle hatchlings have started to emerge from their nests along the beaches and make their way to the ocean. To help these beautiful creatures, more than 700 community members came out to the annual Clean Up for the Hatchlings event last Saturday and removed 1.5 tonne of litter from beaches and waterways from Coolum to North Bribie. Council’s TurtleCare conservation officer Dr Simone Bosshard said a record 735 volunteers aged from 2 to 98 years of age joined in the clean up. 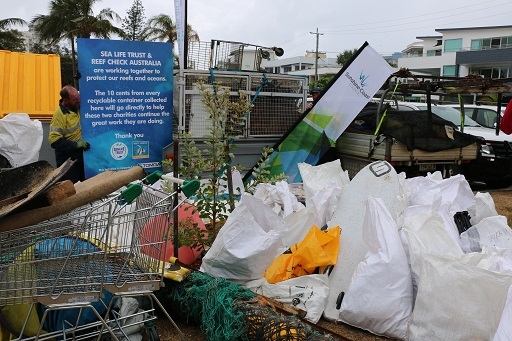 “Last year’s event saw more than 800kg of debris removed from our beaches and waterways, and this year we’ve set a new record removing a total of 1.525 tonnes,” Dr Bosshard said. “Littered rubbish is mistakenly eaten by turtles both young and old, and can cause malnutrition or starvation for hatchling sea turtles as they migrate across the Pacific Ocean. TurtleCare and community volunteers collected everything from small plastics to shopping trollies and surfboards. The most common items collected were cigarette butts and small hard and soft plastics. Reef Check Australia South east Queensland programs manager Jodi Salmond said that this year there was a lot more confetti picked up, amongst other items. “From the rubbish picked up on land, foil based confetti showed up a lot this year. We also found zip ties, plastic clasps from bread bags, and dog waste bags particularly at picnic areas like La Balsa Park,” she said.